Polapremium is a distributor for instant cameras and instant film. It is based in Vienna (Austria) under the name UNVERKAEUFLICH Handels GmbH. It was previously called unsaleable when it started in 2005, offering a selection of bags, LED belts and instant film. It was renamed Polapremium when it decided to focus only on instant film products. The founder of the company Dr. Florian Kaps previously worked at Polaroid. The shop has been renamed Impossible online shop on Feburary 24th 2010. It specialized on selling Polaroid instant film. It mostly concentrated on selling "unsaleable" short dated and expired film. Since Polaroid had ceased the production until 2008 Polapremium bought a huge lot of 500,000 film packages from Polaroid's stock. The film is sold online and through stores in Berlin (Germany), Tokyo, New York, Vienna and local dealers. Naturally most Polaroid film packages have an expiry date in the past. Therefore Polapremium plans to launch an own instant film production with the old machines of the Polaroid company in Enschede (Netherlands). Since the making of instant film is no easy task the result might be the remake of one popular film type in the future. This endeavor is called The Impossible Project. For silvershade and colorshade produced film see Impossible. Polapremium had commissioned Polaroid to manufacturer of a number of exclusive instant films for their online store. These were manufactured before the plant closures in Mexico and Enschede. Polaroid Chocolate film (Dec, 2008) for Type 100 packfilm ISO 80, brown film, made from using color negative film but with a black and white developer. Polaroid Sepia film (Dec, 2008) for Type 100 packfilm, ISO 1600, sepia. Polaroid Blue film (Dec, 2008) for Type 100 packfilm, ISO 80, blue & white with a matte silk finish. Polaroid Image Softtone (Dec, 2008) for Spectra/Image/1200 cameras, ISO 640, color film made from expired chemicals. Polaroid SX-70 Blend (2006) for SX70 cameras. A color film with a filter. Polaroid Artistic TZ (Dec, 2008) for SX70, color film made from expired Time-Zero chemicals. Defective, test or not up to spec films in manufacturing are sometimes repackaged and marketed based on their flaws. 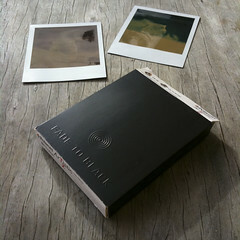 Fade to Black (Nov, 2009) for SX70 cameras, color film that does not stop development and image will fade to black in 12 hours. Polaroid 600 Edge Cut (June, 2010) There is a larger chance of defects in edge cut negatives. Polaroid Artistic TZ Edge Cut (June, 2010) There is a larger chance of defects in edge cut negatives. Polaroid Image Softtone Edge Cut (Sept, 2010) There is a larger chance of defects in edge cut negatives. This page was last edited on 6 November 2017, at 11:45.